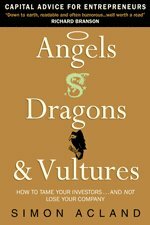 Angels, Dragons and Vultures is a guide for entrepreneurs to all aspects of venture capital. It provides advice on different sources of funding, suggests how to raise money successfully, and exposes the implications of different deals. Then it tells you how to manage your new investors and maps out the route to a successful exit. Simon Acland enjoyed a successful 25 year venture capital career. He was Managing Director of Quester, one of the UK’s most active early stage technology investors. He has been on the Board of many companies, most of which have been successfully sold or floated on various stock exchanges. I crossed from Corporate to VC, partly due to the Author's insights into the VC industry. Back then it took me a few lunches to extract his experience of the sector. Now everyone can benefit via this insightful read! Any UK business considering raising venture capital should read this; so should anyone starting out on a career in venture capital. It is balanced, comprehensive and very useful. Witty, factual and ridiculously useful. Gives a tremendous amount of practical information, accessible technical explanation for people who are new to the field, and advice, all while being a witty and fun read! Masterly - no one knows this field better! Well worth a read and very helpful. Brilliant book. I loved it, highly recommend to everyone! Highly readable. Bravo Mr Acland. A very easy to read guide on how VCs work. Any entrepreneurs considering raising equity for their business venture would benefit from reading this book. strangely I found this after reading Simon's The Waste Land (which is worth buying). Was intrigued to see if he cld carry off a "technical" book with the same skill as he did with his work of fiction. He has. Practical, friendly and very valuable advice for company founders - delivered in a very clear and accessible way. As an entrepreneur a good book to read. I wish I'd read this book before doing an MBO. Very readable and excellent down to earth advice. A 'must read' for anyone involved or thinking of becoming involved with Venture Capital or Private Equity. Humour in a tense domain ... a very welcome, and wise, antidote to so many other dull business book offerings. A highly informed and very readable guide: great reading for the entrepreneur; sometimes uncomfortable reading for the venture capitalist. Mr. Acland has the temerity to ask in Chapter One: "Venture Capital: Are You Sure You Want It?" After reading this excellent book, the answer may be no. Blunt, incisive, and often humorous advice. Highly recommended by this Silicon Valley CFO. Anyone buying this book, and taking serious note, is quite likely to see a enormous return on their investment of time and money on this book. The investors the author writes about would kill (well OK not quite) but they would do a lot for that: As the author illustrates. Everything you'll need to know on the subject and readable too! A must read for anyone raising money from investors. An excellent book!